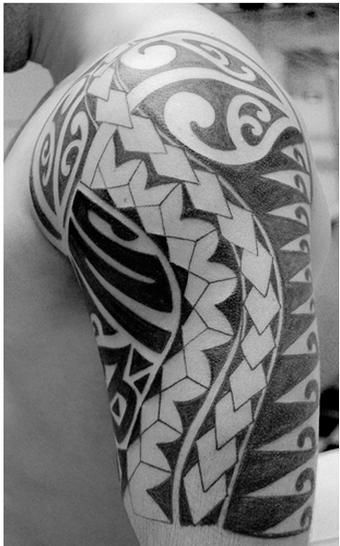 Tribal tattoos on the arm and shoulder like this one are extremely popular tattoo designs for men these days. Although this tribal tattoo is very large, the tribal design itself is actually very simple. The tat is made up of only a few different kinds of designs, including geometric shapes like diamonds and triangles, as well as swirls and other designs. The tribal tattoo is inked in black and white and is located on the upper part of this guy’s left arm and shoulder. Half sleeve tribal tattoos like this guy’s arm tat are becoming more and more popular among men. Besides the fact that these tattoo designs look cool, they also help accentuate certain body parts, like this guys arm and bicep. In some cases, tribal tattoos may also hold a deep meaning for the wearer, although most are probably chosen just for aesthetics!